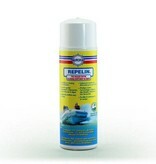 Foul Release Coating for Inflatable Boats and RIB's Super-hydrophobic Bio-release. Protects against Algae, Barnacles, Zebra Mussels and Osmosis Blisters. Improves Performance.